A councillor dismissed from his job after a city daily’s investigation has accused local newspapers of being “corrupt” – and backed proposals for a fresh Leveson inquiry into the industry. Cllr Mike Sparling, who sits on Plymouth City Council, hit out after the recent House of Lords vote in favour of a clause which would see publishers not signed up to a state-approved watchdog pay both sides’ costs in data protection cases. 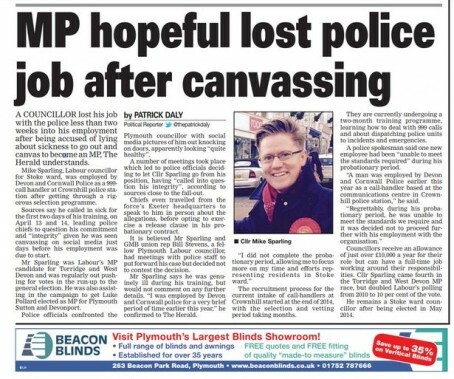 Back in 2015, the Plymouth Herald’s then political reporter Patrick Daly revealed how Cllr Sparling was sacked from his job as a police call handler after being accused of calling in sick to go canvassing in that year’s general election, in which he was the Labour candidate for Torridge and West Devon, although Cllr Sparling himself denied this was the case. Peers recently voted in favour of a clause which closely mirrored the infamous Section 40 of the Crime and Courts Act, which was designed to force publishers to sign up to a ‘recognised’ system of press regulation. However both Theresa May and Culture Secretary Matt Hancock have vowed to overturn the vote in the House of Commons. As Mandy Rice Davies said at the trial involving the Profumo scandal” Well, he would say that wouldn’t he”. Only people with something to hide want stricter controls on the Press in this country which already has to work within some of the most severe laws in the world. I should add to my previous comment : – and these are people running our councils. He did wrong but won’t admit it which is why he is trying to muzzle the Press.